Is it Wednesday already? I'm finding the days and weeks melding together at top speed. Sigh. For Ginny's Yarn Along I worked a bit more on the Travel Shawl, which I think will be finished by later this week (YEAH!!!) and began and finished a new project as hinted at earlier. It's a very purple. It's another cowl. Its name reminds me of Star Wars: the Darkside Cowl. The yarn was another Malabrigo from my stash called Violetas. Reading continues with more of the same school books and a few magazines and cookbooks. Nothing really to report. Yarn Giveaway: Thank you for the comments on last week's post. It was fun to read through each one. I asked my youngest to randomly call out a number between 1 and 35. That is a beautiful neck thingie and I love the colorway you've chosen. I'd love to win those gorgeous scarlet skeins of yarn. Congratulations, Lydia! Just email me your information (my email is found under my copyright button), and I'll send out your yarn. If I don't hear from you within 48 hours, I'll go ahead and pick another name. Thanks! 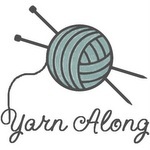 Yarn Along ~ October 5 and a Yarn Giveaway! For Ginny's Yarn Along this week.... a longish post, too many photos and a little giveaway if you end up reading this entire post! Ripping rounds...sounds like it should be a musical group, doesn't it? Rather, it's what I've been doing (save a few days ago) to the Travel Shawl. The process is so painstakingly s-l-o-w. At least the way I'm doing it. Stitch by stitch. If the pattern were stockinette, I would try slipping a waste yarn through the row where I wanted to begin again and simply and quickly undue the extra rows. But with this pattern...ugh! If you have another method of ripping rounds, please speak up! (I won't need to rip back any more rounds for the shawl ~ yeah! ~ but definitely could use the tips for future projects.) Presently, I'm almost through with the 2nd chart and onto the final leg of the pattern. All I can say is thank goodness for other short, easy projects. A little 'mindless' knitting is always a welcome change. My 'mindless' knitting from last week was fun and quick. It's the Malabrigo Neck Thingie. Yes, I'm actually modeling it myself (a little brave step!). It'll be on its way to my mom's house soon. I made just a few minor alterations. Ravelry info here. In the reading department, I've added Dickens' A Tale of Two Cities. My older two are reading this for school, and once again, since I haven't read it since highschool and can't remember much (and I keep getting it mixed up with Les Miserables which I know I shouldn't, couldn't possibly do), I've decided to read this alongside. Now onto the giveaway...I'm presently trying to catalogue my yarn stash so that I actually know what and how much I have of a particular yarn. Not done yet, but I thought it might be fun to give a few skeins away. The three skeins are a little too fire-engine red for me, so I thought someone else would like them and could use them. You must go to the Slug & Ant Blog to post a comment for the giveaway. Go here to see more about Slug & Ant. And of course, you can visit Salty Graphic Studio too! This is such a cute & family-friendly gift to give. Salty Graphic Studio is having its first giveaway: 1 copy of their soon-to-be-released DVD for preschoolers, called the Slug & Ant Show. Go here to sign up for the giveaway. Ends December 10th! And...if you don't win the giveaway, you can always purchase a copy here. A little surprise arrived in the mail yesterday. Was is a truckload of fabric? No. A life-time supply of yarn? Nope. It was just what I needed...coffee! Image: Jean Morrison (used by permission). ... Giveaway. A fabric giveaway! I remember dancing to Van Morrison's song long after it had premiered and thinking, "what is this song?" What did I know? I was only a freshman and had poor musical tastes then. The dance was a high school dance (the only one I went to besides the overrated senior prom). Actually it was a dance-a-thon, and we were raising funds for some project for the school. So what does the reminiscing about a song have to do with the giveaway? Jenean Morrison, who has a beautiful Free Spirit line of fabrics entitled 'Moondance' is giving away some free fabric! 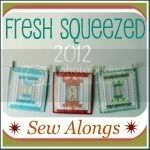 You can also visit her work on Etsy (she'll be starting to carry some of her fabrics there soon!) And visit her site here and stop in to say hello at her blog.